Come on a journey with Africa’s finest nature photographer to lands of time-honoured cultural traditions and unspoilt natural wilderness. Here is the ‘real Africa’ – astonishing in its diversity of wildlife, breathtaking in its natural beauty and unforgettable in its bursting floral kingdom. 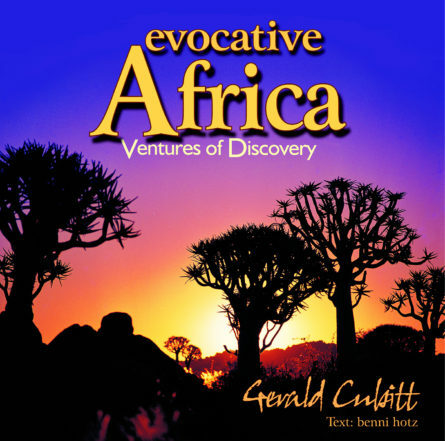 Evocative Africa is a visual journey taking the reader through Gerald Cubitt’s selection of the ‘unmissable’ in sub-Saharan Africa. This extensive collection of images juxtaposes the scale and grandeur of the continent with an intimate attention to smaller, less obvious wonders. The informative commentary reveals the social, ecological and geographical context of the images. The book bursts with a multitude of images. The reader will be immersed in South Africa, will visit Zimbabwe, Malawi, Mozambique, Tanzania, Kenya, Botswana and Namibia. Just offshore, no lifetime’s safari on the east coast of Africa can ignore Madagascar, perhaps the most compelling hotspot of biodiversity in the world. Four and a half years have gone into the design and preparation of this book and the endeavour of the photographer and publisher is to make Evocative Africa the best of its kind ever produced in South Africa: a book that captures the magic and character of the ‘real Africa’ – its timeless wildlife and wilderness, its colourful and proud ethnic heritage and, of course, its stunning diversity of landscape. It represents the culmination of many years of photographing Africa, her people, her places and her wildlife. It celebrates destinations we can all enjoy, showing them in a new light, giving us many moments of delight from places we already know to be astonishing. Gerald Cubitt is a British born wildlife, natural history and travel photographer based in Cape Town. His work over the years has been extensively used in diverse print media applications throughout the world. Published books include Splendours of Southern Africa, Scenic Southern Africa, The Natural History of Southern Africa, Journey Through South Africa, Zimbabwe – The Beautiful Land. Gerald’s passion for wildlife and natural history has taken him and his wife Janet across the globe. In the end though, it is Africa that has given him the greatest opportunity and inspiration.